Greenville, South Carolina -The NPHC of Greater Greenville is sponsoring a Spring Jazz Mixer on Thursday, April 17, 2014. Please join the Upstate Greeks for a night of Fellowship and good food with the local Council at a local eatery, Blues Boulevard Jazz on 300 River Street, Greenville, South Carolina. This year, the NPHC Council has begun to hold quarterly mixers for Council Chapter members to offer an outlet for Greek Fellowship. This is the second mixer the Council has sponsored at this location. The first one was held in December for the Council Holiday Mixer. Complimentary refreshments will be available until 7:30 PM and meal options will be available as a dutch option for those who want to stay for dinner. The Mixer starts at 6:00 PM and live music starts 8:30 PM. The Council has reserved 30 seats and we are asking you to please RSVP at https://nphc-greenville-sc.eventbrite.com by April 16, 2014. RSVP tickets are free but please note, there is a $10.00 minimum purchase of food or drinks required per person in lieu of a cover charge. This event is adult only. 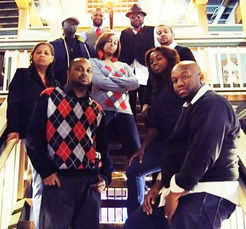 The Featured Band will be Hott Gritz of Spartanburg, SC. Hott Gritz is sure to deliver something for everyone ranging from rock, country, pop, neo-soul, blues, jazz, funk, R&B, gospel and smooth jazz.